The #1 Jewelry Buyer Casa Grande has to OFFER! Have you been searching for somebody to buy your jewelry for the best possible prices? Does it seem like nobody knows the true value of your precious items? Well the search is over! Come visit Casino Pawn and Gold and see why we're the premier jewelry buyer in all of Casa Grande. Our employees are extremely professional and know the true value that jewelry has behind it. Our pawn shop will always offer you the best possible prices and we pride ourselves on having the BEST customer-employee interaction in the entire pawn shop business! Never leave a pawn shop disappointed again; pay us a visit today and get the most possible cash for your valuable jewelry! Why should I sell my jewelry to your pawn shop? We all know that gold prices have been ever increasing, but did you know that even most gemstones, precious metals, and just jewelry in general are increasing in value on the market. That equates to more money for you! If you find yourself in need of cash, or maybe you just need a little extra padding in your wallet, come to our pawn shop in Casa Grande and sell us your old or broken jewelry. Maybe you have a ring that doesn't fit anymore. A necklace that's a little out of style now? We will even buy gold teeth fillings, as crazy as that sounds! Our incredibly friendly staff will always appraise your jewelry for the highest value to give you the MOST cash on the spot! What kinds of jewelry does Casino Pawn and Gold buy? Our pawn shop in Casa Grande will buy anything of value! All types of gold and silver jewelry, gold scrap, silver scrap, anything with gemstones, all watches, even broken, dental gold, brooches and pendants, earrings, and cuff links! 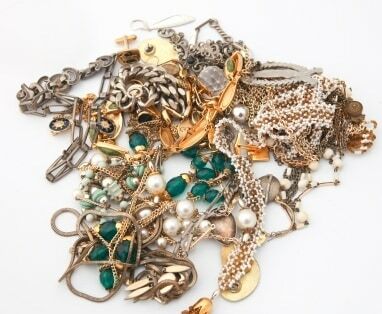 We will buy your jewelry no matter the condition! Come in today and sell your jewelry to Casa Grande's premier jewelry buyer, Casino Pawn and Gold! We guarantee you won't be disappointed. Also proudly servicing Coolidge, Florence, and Maricopa! Bullion Buyer - This page describes how we are the #1 bullion buyer in Casa Grande! Estate Jewelry Buyer - Here we describe what estate jewelry is and give a few examples as to what we buy. Gold Buyer - This page gives light to why we are Casa Grande's BEST bullion buyer! Cash for Gold - We describe here how our cash for gold process works and why it's better than the competitions! Silver Buyer - Along with gold, silver has been increasing in price. This page describes what kinds of silver we buy. Platinum Buyer - Platinum has been rising for quite some time! At this page, we describe the kinds of platinum we buy and why we are the best platinum buyer in Casa Grande. Diamond Buyer - Here we describe our process for buying diamonds! Proudly serving Casa Grande, Coolidge, Florence, Arizona City, and Maricopa!